Felool is a term which was coined early on in the revolution, used in reference to the corrupt political remnants of the former regime, led by the National Democratic Party (NDP). It has since evolved to include sympathizers of public figures associated with the Mubarak era, including Ahmed Shafik and the military. Old regime figures have struggled to find their place after Mubarak stepped down, and for almost two years now, our fight has been to prevent them from reintegrating them into Egypt's politics. But when I heard the announcement that they were not welcome at a mass protest, it struck me as off-target. Not only was it apologetic and unnecessary, but looking back at recent events, it wasn't ‘Felool’ who were working against the interests of the Egyptian people by promising to lift subsidies.It wasn’t Felool who sanctioned the arrests and imprisonment of numerous people for the preposterous charge of ‘defaming religion’ - including two children aged nine and ten . It wasn't Felool who responded to chants with violence just a week prior. In fact, many of them have been absent in every way except for the continued rhetoric of blame used in daily discourse, and more notably, in the news about attempts by the current regime to reintegrate them into political life or the ailing economy. That enemy no longer exists or rather has no clout. Later that day, reports emerged that Amr Moussa’s political party, al-Motamar, was attacked by protesters, among them members of the April 6 movement. This was an unnecessary attack, particularly since Amr Moussa’s run for presidency did not gain the support of the Felool, who could have used their finances to leverage his candidacy. From a revolutionary perspective, the Felool rhetoric should have ended as soon as Morsi came into office, or at the very latest when Field Marshal Hussein Tantawi and Sami Anan were side-lined. Meanwhile, the current regime is determined to extend the offer to reconcile with corrupt figures, a move initiated by the interim Supreme Council of Armed Forces (SCAF). Those who have committed crimes are granted amnesty with many of them honored. The same oppressive measures are still in place, if not arguably worse. People continue to be targeted and imprisoned for their opinions, and conditions for oligarchy and dictatorship are being entrenched in the new constitution currently being drafted. It therefore makes no sense to separate Felool from the current regime. After all, people rejected the old regime for the injustice it propagated rather than individuals who helped carry out the vision. That is not to say that what Felool stand for need not be fought vehemently. The police state continues to act with impunity and military personnel who have committed heinous crimes remain not only large, but are protected by Egypt’s current president Mohammed Morsi. Whether oppression is done in the n­ame of secular neoliberalism or under religious pretense, it should not detract us from the underlying reality. True remnants of the old regime are still in existence in the form of an unreformed oppressive police force, a complicit army and numerous corrupt institutions. 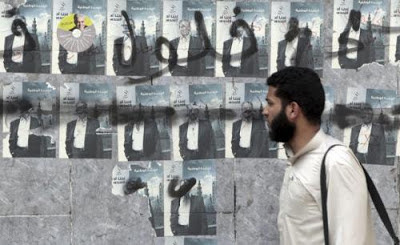 However, using a word like Felool to separate these institutions from the Muslim Brotherhood can be counter-productive, particularly that they are now in power.Felool may have been complicit in a corrupt system set up some time ago and have been working within its framework but today, those in power are constructing a new framework, eerily similar to its predecessor. This makes them more accountable and condemnable than their NDP counterparts particularly after people revolted against that form of rule. The Muslim Brotherhood's political party, the Freedom and Justice Party (FJP) and its president seem to be attempting to take over the corrupt institutions set up by the former regime to their advantage rather than reform them. The most recent example is the attempt to replace the General Prosecutor rather than work on legislation to guarantee true judiciary reform. The fundamental issue with the use of the word Felool is that it detracts from the real fight and the real enemy. The anger directed towards them is more emotional, and does nothing to address genuine risks. There’s a fictitious enemy called Felool that does not truly exist. This fictional existence serves only to protect those in power, just as it protected SCAF from being associated with the Mubarak regime of which they were a part . In continuing to use the term Felool we are deceiving ourselves as to who the real enemy is. Such a term can initiate a witch hunt but we’ll always end up fighting windmills. First published in Atlantic Council on October 30 2012.